The Sky Cafe Bluebird Feeder combines the patented squirrel-proof blue dome with a vinyl coated 1 1/2 inch wire chamber that allows easy access for bluebirds. Excellent for attracting bluebirds & orioles, while keeping those gluttonous robins and grackles out. As with every bird feeder, this product comes with a *Lifetime Warranty against squirrel damage*. 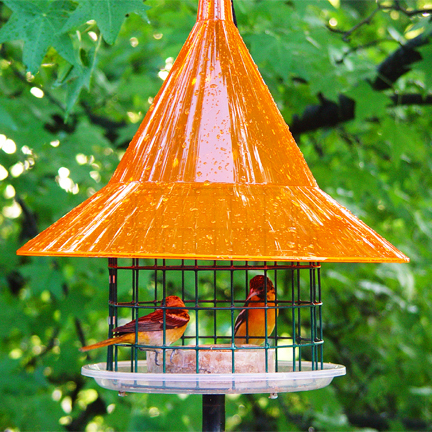 Made in the U.S.A., this bluebird feeder comes with a new custom made resin (polyethylene) that is sturdy and UV stable. The large 17" diameter squirrel-proof dome protects seed from both rain and snow. The eco friendly dome is made from 100% recycled plexiglas and makes the squirrels slide off every time. Comes with a meal worm cup that is removable for easy cleaning. Also included is a 2 foot hanging chain. 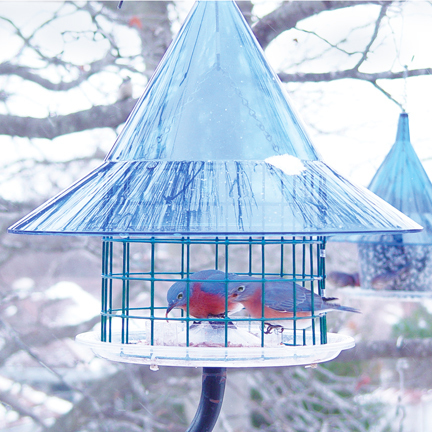 The bluebird feeder is pole mountable, as the above image shows. (cord & cord lock sold separately for easy pole mounting).